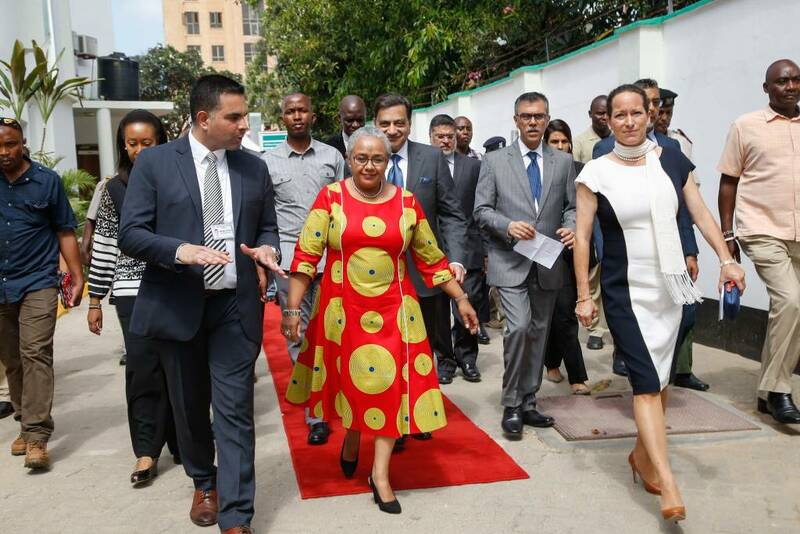 First Lady Margaret Kenyatta is on Friday expected to unveil the latest technology on heart disease when she officially launches the Cardiology Programme at the Aga Khan Hospital, Mombasa. The First Lady will launch the modern and State of the art digital flat-panel detector and fluoroscopic x-ray system at the hospital’s refurbished cardiac catheterization laboratory (Cath Lab). The Aga Khan Hospital, Mombasa becomes the first health facility in the country to install this latest technology. It also marks the first time that advanced heart disease procedures can be performed in Kenya, outside Nairobi. The first such procedure was successfully performed at the hospital on Wednesday. Over 20 different procedures can be performed under the new Cath Lab which has a capacity for 15 patients per day, according to Cardiologists at the Aga Khan Hospital, Mombasa. These procedures include Diagnostic coronary angiography, Percutaneous transluminal coronary angioplasty (PTCA) and stenting for patients with damaged heart vessels, Temporary Transvenous Pacemaker insertion and intra-aortic balloon pump insertion. Other procedures that will now be locally available are Pacemaker and automatic defibrillator implantation (epicardial, transvenous), Diagnostic peripheral angiography for patients with peripheralarterial occlusive disease and Port Cath and PICC line insertion for administration of chemotherapy. Patients with such problems as Right heart catheterization requiring further evaluation for heart failure, Valvular heart diseases and Pulmonary hypertension will also be assisted as will those with inferior vena cava (IVC) filter placement challenges. “The Cath Lab aims to provide cost effective and accessible treatment for cardiovascular diseases (CVD) locally”, said Aga Khan Hospital, Mombasa, Chief Executive Officer, Mr Ifran Khan today. Mr Khan said the new technology will cut on the large numbers of Kenyans travelling to other countries to seek interventions over heart problems. The Cardiology programme that the First Lady launches tomorrow offers a continuum of high quality health services, ranging from emergency treatment of various heart diseases such as heart attack, high blood pressure, heart failure and cardiac rehabilitation. The rehabilitation, expansion and modernization of facilities at Aga Khan Hospitals in Mombasa and Kisumu are being funded by the Francaise de Development (AFD) and the Aga Khan Development Network (AKDN). Princess Zahra Aga Khan and members of the Aga Khan Health Services (K) board are also expected to join the First Lady at Friday’s function that brings together over 150 health professionals and partners. The latest technology on cardiac complications is now locally available and Kenyans with heart problems can seek intervention without the need to travel abroad. 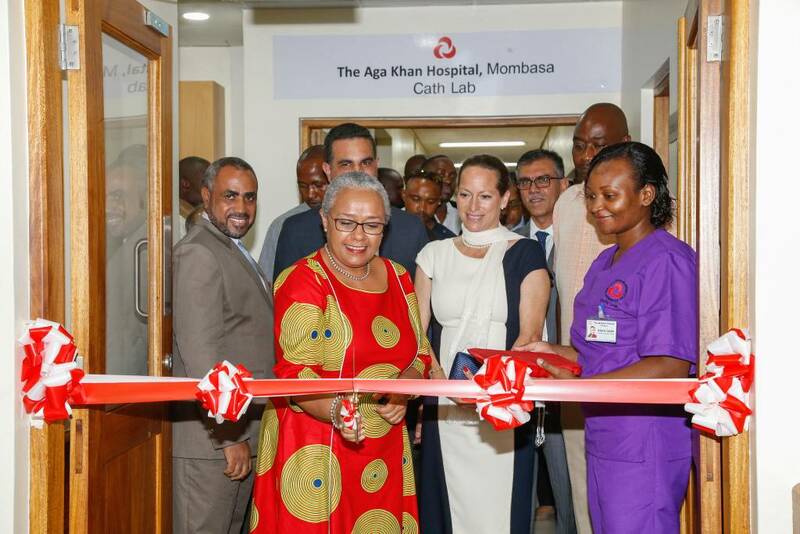 First Lady Margaret Kenyatta unveiled the modern and State of the art digital flat-panel detector and fluoroscopic x-ray system at the Aga Khan Hospital, Mombasa’s refurbished cardiac catheterization laboratory (Cath-Lab). She also inaugurated the hospital’s cardiology program during the ceremony also graced by the Aga Khan Health Services Board Executive Committee chair, Princess Zahra Aga Khan , Regional Director, French Development Agency (AFD), Mr Bruno De Prince and several foremost cardiologists and partners. The Cath-Lab, latest in Kenya and the first of its kind outside Nairobi, can offer more than 20 heart-related services and has a capacity to handle 15 patients with cardiac problems per day. Medical procedures that can be sorted at the Cath-Lab include Diagnostic coronary angiography, Percutaneous transluminal coronary angioplasty (PTCA) and stenting for patients with damaged heart vessels, Temporary Transvenous Pacemaker insertion and intra-aortic balloon pump insertion. The First Lady described the Cath-Lab as a historical, important initiative and the most innovative investment that will expand access to quality diagnostic, timely and accurate treatment not only to the people of the coastal region, but the entire country. The First Lady said the visionary project promises to offer many Kenyans readily available and diagnostic treatment, as well as training for medical professionals and research. She said besides enhancing access to health facilities, the new Cath-Lab will also offload the existing pressure on Referral Hospitals and medical specialists. The First Lady said coronary artery diseases continue to be a major threat in Sub-Saharan Africa including Kenya where more than 30,000 avoidable deaths occur annually, mostly affecting the younger generation in the productive age segment. “Dealing with this new phenomenon requires an aligned vision, cultivation of reliable and strong partnerships between the public sector, professionals, development partners and the private sector”, said the First Lady. She said that during her four-year journey with the Beyond Zero initiative, travelling across 47 counties, she had witnessed the invaluable and pivotal role that partnerships play in positively impacting communities and complimenting Government effort to expand access to quality, timely and affordable healthcare. The First Lady said Kenya has spent the last decade addressing the issue of quality healthcare access where the country has registered laudable success. The Cardiology program offers a continuum of high quality health services, ranging from emergency treatment of various heart diseases such as heart attack, high blood pressure, heart failure and cardiac rehabilitation. The rehabilitation, expansion and modernization of facilities at Aga Khan Hospitals in Mombasa and Kisumu are being funded by the AFD and the Aga Khan Development Network (AKDN). Princess Zahra said the presence of the First Lady at the ceremony demonstrated the strong and important partnership between the Government and the AKDN. She said besides training of health professionals, the Aga Khan Health Services provided health care to over 1 million Kenyans last year. 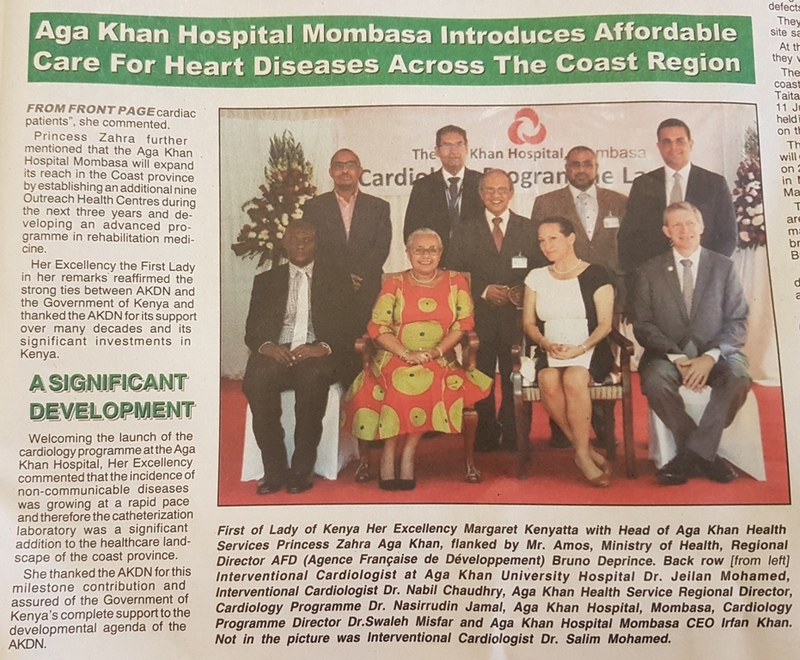 Princess Zahra said the Cardiology Program is an important step by the Aga Khan Health Services and a similar program is planned for Kisumu City. She however underlined the need for sustainability, capacity building and continued partnership with the government for the program to successfully continue saving lives. AKDN (Kenya) Diplomatic Representative Dr. Azim Lakhani and the Aga Khan Council for Kenya President Mr Nawaaz Gulam also attended the ceremony. The latest technology in the treatment of cardiac complications is now locally available and Kenyans with heart problems can seek help without having to travel abroad. 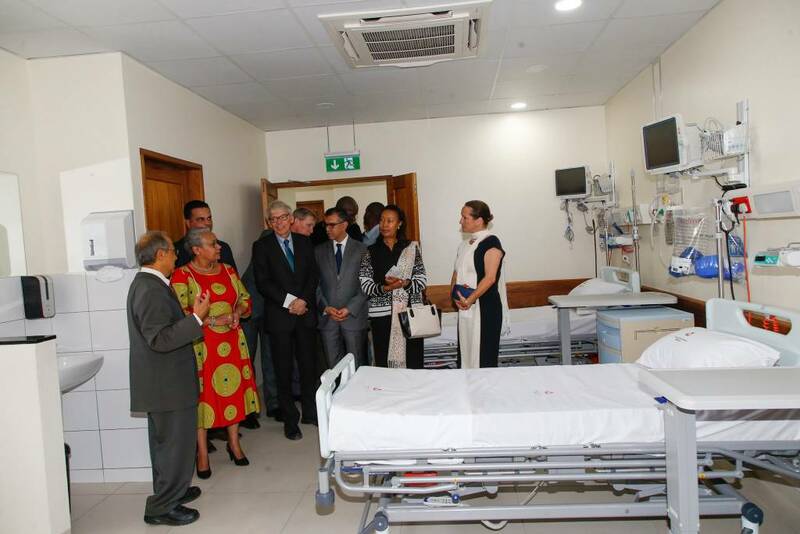 First Lady Margaret Kenyatta on Friday unveiled the state-of-the-art digital flat-panel detector and fluoroscopic X-ray system at the Aga Khan Hospital, Mombasa, in the refurbished catheterisation laboratory. She also inaugurated the hospital’s cardiology programme during the ceremony, which was also attended by Aga Khan Health Services Board executive committee chairman Princess Zahra Aga Khan, French Development Agency regional director Bruno De Prince and several cardiologists and other project partners. The cath-lab, the latest in Kenya and the first of its kind outside Nairobi, can offer more than 20 heart-related services and has the capacity to handle 15 patients with cardiac problems per day. Patients requiring further evaluation for heart failure, valvular heart diseases and pulmonary hypertension will also be assisted, as will those with inferior vena cava filter placement problems. “I’m confident that together we will find the right approach to increase public awareness and develop practical and sustainable solutions to treatment of cardiovascular diseases,” Kenyatta said. Dar es Salaam — Princess Zahra Aga Khan on Friday launched the new state-of-the-art medical laboratory and a low-cost inpatient unit at the Aga Khan Hospital here. The new lab is part of Aga Khan Hospital's expansion project which is estimated to cost around $80 million. The amount includes an extra $53.5 million as a loan from the French Development Agency. It has also acquired $26.3 million as a grant from the Aga Khan Development Network. The hospital is set to undergo expansion in its second phase by constructing a new 14,000 square metre wing. The laboratory is designed to cater for routine and specialised tests within healthcare services, said the hospital management. The facility will enable the Aga Khan Hospital to expand laboratory services by introducing advanced testing for blood transfusion, medicines, tuberculosis diagnosis, molecular biology laboratory tests and cancer diagnostics in the country. According to Dr Omer Sherman, director of Laboratory at Aga Khan Hospital, the new facility has now been recommended for accreditation by internationally recognised organisations. "The accreditation along with the already established quality management system and competent personnel will allow the hospital to provide comprehensive, appropriate, and timely investigations of the highest quality, serving our patients more effectively," he said. A 20-bed general inpatient low cost unit, which was inaugurated alongside the new lab, aims at increasing access to health services to patients in Tanzania. According to Sisawo Konteh, chief operating officer, the unit, like other services in the hospital, will now provide the same quality care and international standards in terms of space, utilities and other aspects of management, clinical and support services. 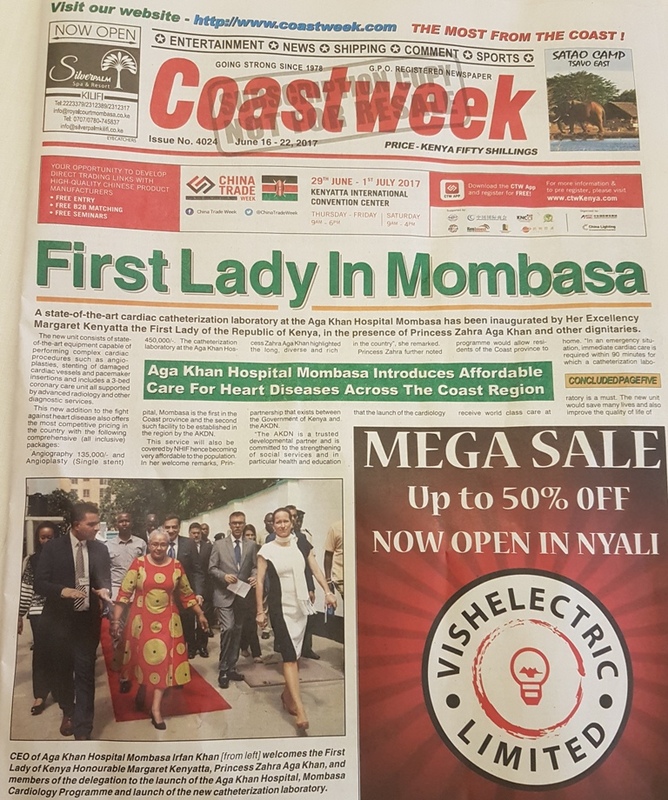 Today's Coastweek newspaper (15-22 June 2017 edition) gives several photos and news on Aga Khan Hospital and the recent visit of Princess Zahra with Lady Kenyatta. The first heart laboratory outside Nairobi has been opened at the Aga Khan Hospital, Mombasa. 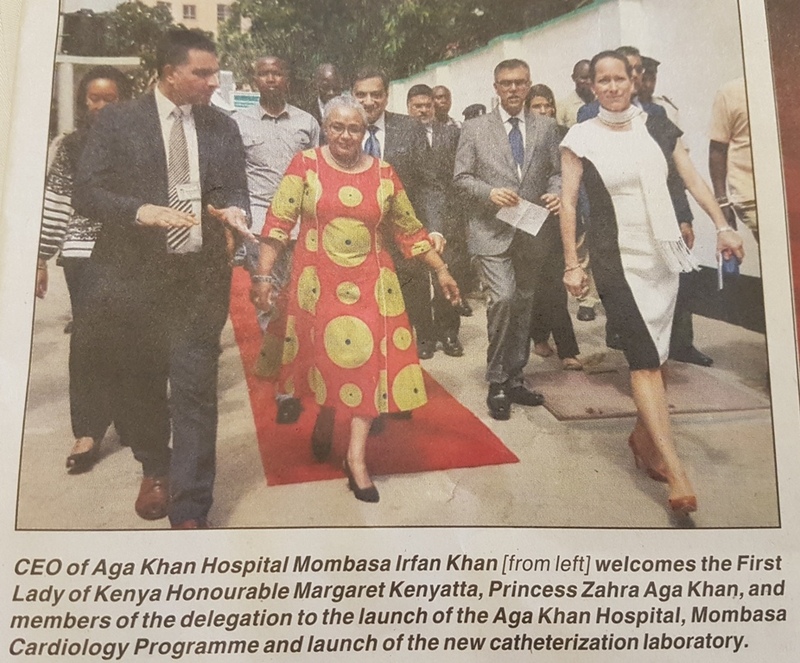 First Lady Margaret Kenyatta led a colourful inauguration ceremony of the state-of-the-art cardiac catheterisation laboratory that was also graced by Princess Zahra Aga Khan and other dignitaries. Dar es Salaam — Thousands of people from various parts of Dar es Salaam today Sept 6 have showed up at a free health screening event taking place at Mnazi Mmoja grounds. The event, which is a result of a media campaign organised by the Dar es Salaam Regional Commissioner, Mr Paul Makonda, has brought together healthcare providers from both private and public health institutions including Muhimbili National Hospital (MNH) and Aga Khan Hospital, who are conducting medical screening on both communicable and non-communicable diseases. The doctors are offering free consultation and basic health checks on cancer, cardiovascular, diabetes and hypertension, amongst other health complications. Dr Harrison Chuwa, a consultant oncologist at Aga Khan Hospital, said cervical and breast cancer were the most frequently diagnosed health complications among majority of women who turned out at the screening. "What I have learnt is that there are so many people outside there with cancer complications but they don't know that they have the disease, therefore, I encourage more people to come and get diagnosed," he said. THE Aga Khan Health Services in the country, yesterday, launched a new polyclinic at Kibada area in Kigamboni District in Dar es Salaam region, in a move to improve provision of quality health care services to the community. Speaking during the launch, Aga Khan Health Service, East Africa, Regional Chief Executive Officer, Sulaiman Shahabuddin said their goal is to establish and develop integrated health system and expansion of Aga Khan main hospital that would cost 176bn/-. He said the project is aimed at supporting the government in improving the health sector including increasing the number of beds for patients, teaching on health education and raising the network of 35 health promotion centres in order to simplify access to better health care services. “This health centre will provide various health care services including general consultation, ultrasound, laboratory, pharmacy, x-ray, specialist consultation for Ear Nose Throat (ENT), mother and children, family physician and dermatologist,” said the CEO. The Kigamboni District Administrative Secretary, Ms Rachel Mhando said the government will cooperate with the institution to make sure that health services in the country are improving to build a nation of healthy and strong people. She made the remarks as the guest of honor at the event on behalf of the Deputy Minister of Health, Community Development, Gender, Elderly and Children, Faustine Ndugulile. Ms Mhando insisted that the institution use their dispensaries in providing quality health services to the community, according to the guidelines of the Ministry, “Through this health centre, I hope you will provide quality health services that are friendly to the people, according to the guidelines of the relevant ministry. Thank you for supporting the government because you are doing the right thing at the right time,” she said. The County Government of Nandi is turning to deep-pocketed investors to help boost service provision in the region's key health sector as it looks to fill gaps left by public facilities. Governor Stephen Sang, who is the youngest County boss in Kenya, reckons that such investment initiatives will help raise levels of healthcare service provision and create employment opportunities in the devolved unit. “Public Private Partnerships in the health sector through exchange programmes, internships and creation of employment opportunities is our goal,” said Mr Sang who spoke during the opening of the Aga Khan Satellite Clinic in Kapsabet town Sunday. “We don’t want to have cases where our locals will have to rely on hospitals in Uasin Gishu County for medication for ailments that can be handled in our hospitals,” he added. In September, Mr Sang directed all county staff to seek treatment at public facilities in what he said was a bid to improve healthcare services in the region. Chitral : Majority of the employees of the Aga Khan Health Services Pakistan AKHSP Chitral continued their protest sit in for the third consecutive day. The employees were protesting the plans of the management to terminate services of employees without giving them due benefits, the employees said talking to this correspondent. Most of the employees were women working in different health centers. Dr Zafar Ahmad, the head of Community Health and Government Relations, talking to this correspondent from Islamabad on phone said that they were closing seven health centers in Chitral. He said the AKHS had already informed the employees that the centers having very low patient visits would be shut but the staff went on a strike. The Aga Khan Health Services (AKHS) is one of the agencies of the Aga Khan Development Network (AKDN) that supports activities in health in Pakistan and several countries around the world. Together, AKDN health activities reach 5 million people annually globally and over 2.2 million per year in Pakistan. The agencies also work closely on planning health delivery improvements in Pakistan, training and resource development. In recent years, emerging health care needs, a rapid increase in additional and alternative health care providers, a rise in innovative techniques and the need for greater access to other healthcare facilities has required AKHS to develop a more effective delivery model. In order to increase efficiency and serve growing needs of its patients, AKHS is recalibrating its health service delivery to ensure that it can remain independent and self-sustainable. A cornerstone of this approach is to ensure partnerships with national and local governments and other health service providers – both within AKDN, such as the Aga Khan University, and outside AKDN, such as government health facilities — to ensure improved health services in the long term. Dar es Salaam. Residents of Ukonga suburb in Ilala District, Dar es Salaam, will now have relief following the inauguration of a Sh350 million health centre in their area under the Aga Khan Health Services in East Africa (AKHS-EA). AKHS-EA chief executive officer Sulaiman Shahabuddin said the residents will now be provided with, among others, general consultancy, pharmacy, X-ray, ultrasound and laboratory services. “The centre will also offer consultation in paediatrics, ear, nose and throat, gynaecology, dermatology, family medicine and most importantly mother and child health services,” he said. He said the centre, known as Aga Khan Health Polyclinic would be serving between 100 to 150 patients per day. During the event yesterday, Dar es Salaam regional medical officer Grace Maghembe gave assurance that the government will continue providing an enabling environment for the private health sector. However, she was keen on saying that the government embraces the provision of health services and projects that benefit majority of Tanzanians. “I congratulate the Aga Khan Health Services for their endless and dedicated efforts to improving health provision by adding more heath centres in the suburb in Dar es Salaam. This move that will help improve accessibility health to majority of our people,” she added. Also, the regional medical officer called upon the residents to register with health insurance services, saying this was the easiest way they could access treatment. For his part, AKHS chief operating officer Sisawo Konteh said the polyclinic is the ninth in Dar es Salaam and the institution is planning to build more centres in the region. “We are planning to add more heath centres in Kimara, Kigamboni and the new district of Ubungo because as the population increases, the demand for more health services also increases,” he said. Thirty women and girls, the youngest being a four-year-old, will undergo the reconstructive surgery. The surgery, which costs an average of Sh150,000, is being offered for free. 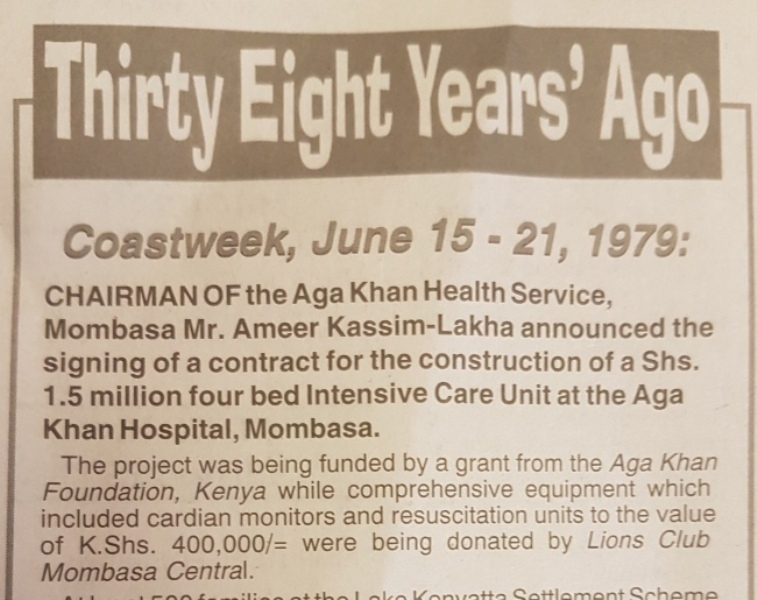 The Aga Khan Hospital in Mombasa in partnership with the Reconstructing Women International began conducting its free reconstructive surgeries for fire accident survivors in the country. On Saturday, local and international specialists performed operations on women and girls suffering from accidental burns and domestic violence injuries. Thirty women and girls, the youngest being a four-year-old, will undergo the operation. The patients, majority of whom come from rural parts of Kenya including Samburu, could not afford the reconstructive surgery. The average cost of the operation is Sh150,000. In addition, patients from Coast region could not easily access the treatment due to lack of specialist surgeons in the area. Patients had to travel to Kenyatta National Hospital in Nairobi for the procedure. Two expectant mothers with burn injuries will also undergo a caesarean-section to give birth. “They [the 30 patients] will all be operated on over the Easter weekend; this is giving back to the society. We thank the Reconstructing Women International team. It is the very first time in Kenya. It is life transforming lives,” Aga Khan Hospital Mombasa Chief Executive Officer Irfan Khan said on Saturday. He said the free medical service will change the lives of women and girls with deformities and injuries. People with deformities often feel stigmatised. “This facility, the health services and the Aga Khan Development Network focuses on women and girls in all our programmes. “We want to help them change their lives, enable them do their day-to-day chores and feel [that they are] part of the society,” Mr Khan said. He said those with hand deformities will be able to write again. “Our local surgeons are working hand-in-hand with a team of Reconstructing Women International. It is not just an international team coming in but our local experts as well. We thank our sponsors, including Diamond Trust Bank and the Ministry of Tourism,” the CEO added. He said internationally renowned surgeons will build capacity for the local doctors. Chief of plastic and reconstructive surgery Andrea Pusic, who is also a professor of surgery at Harvard University, said the team will give lectures to local physicians and students on new reconstructive surgery techniques. “We are also growing capacity of local surgeons. We are all-female plastic surgeons. This is a special combination because in some cases a woman may only feel comfortable with being examined by a team of female physicians,” Prof Pusic added. She said they are targeting women and girls because they often do not seek help when they are injured, and sometimes do not receive the same resources or help as men and boys. “When a woman is injured, it has a very big impact on the family. When we treat these women they will be able to go home, work and take care of their families and girls will be able to go back to school,” Prof Pusic added. The surgeon said the aim of the operation is to restore the ability of the women and girls to function as normal. “If it’s a woman who has a burn on the hand we will restore her ability to use the hand. This kind of operation can take an hour or two," she said. However, other more complex operations could take more hours. She cited cases in which severe burns on the neck and chest make the patient unable to look up or move her head. Prof Pusic said younger patients with contractions of the elbow and shoulder who are unable to move their arms are among the most severe cases. “Initial healing is about a week or two. But this kind of surgery requires longer healing in terms of returning to function, and physical therapy and massaging of scars. Full healing might be more like four to six weeks,” she added. The Minister for Industry, Trade and Investment, Mr Charles Mwijage said on Wednesday 4 April that the government was planning to work closely with the founder and chairman of the Aga Khan Development Network (AKDN) in ensuring that the planned investment is realised. Dar es Salaam — His Highness the Aga Khan has shown interest to invest in Tanzania's Pharmaceutical industry, a cabinet minister has revealed. "I have planned a meeting with the Attorney General to see how we can execute the Aga Khan's initiative in this particular area," Mr Mwijage told participants to the meeting that brought together government officials and investors with a view to attracting investments into the pharmaceutical sector. He said the Aga Khan has contributed a lot in Tanzania's health sector especially through hospitals, medical insurance cover and training of medical experts. "The government is determined to have his ideas fully implemented as we soldier on with our goal of industrializing Tanzania," he added. The director general for the Medical Stores Department (MSD), Mr Laurean Bwanakunu said Tanzania needs a formidable local pharmaceutical industry to save the huge amount that is currently spent on importation of drugs and other medical equipment. "I'm happy to hear that the government is now encouraging sourcing locally," he said. This was stated yesterday by the Minister for Trade, Industry and Investment, Mr Charles Mwijage, who revealed that the Aga Khan plans to set up a $20 million (about Sh45 billion) pharmaceutical plant as part of his contribution to the government’s industrialisation drive. Dar es Salaam — About 40 investors - including the founder and chairman of the Aga Khan Development Network (AKDN), His Highness the Aga Khan - are interested in investing in the pharmaceutical sector in Tanzania. This was stated yesterday by the Minister for Trade, Industry and Investment, Mr Charles Mwijage, who revealed that the Aga Khan plans to set up a $20 million (about Sh45 billion) pharmaceutical plant as part of his contribution to the government's industrialisation drive. The minister made the statement during a meeting that brought together government officials and investors with a view to attracting investments into the pharmaceutical sector. Mr Mwijage said the government was ready and determined to create a supportive environment which would ensure that the revival of the pharmaceutical industry is realised. "I have planned a meeting with the attorney general to see how we can (help) execute the Aga Khan's initiative," he said. According to Mr Mwijage, the government does not intend to ban the importation of pharmaceutical products, but is encouraging local sourcing, adding that this is one of the surest ways of promoting industrialisation and job creation for Tanzanians. "With vibrant local pharmaceutical industries, the government and other clients will be able to order and receive (medicinal) drugs and equipment immediately and without undue delay." His Highness the Aga Khan, through the Aga Khan Health Services, an agency of AKDN, has been contributed a lot to Tanzania's health sector, doing so through building and operating hospitals, as well as providing medical insurance cover and training medical personnel. The new development comes after President John Magufuli called for more investment in Tanzania's pharmaceutical industry, stressing that the move would enable the government to save considerable sums of money in foreign exchange currently spent on importing medicines and medical equipment. Dr Magufuli's remarks were delivered at an event to officially hand over 181 vehicles worth Sh20.75 billion to the Medical Stores Department (MSD) for distributing medicines, equipment and other medical supplies. Mr Mwijage added that pharmaceutical industries will also help MSD to reduce expenditure in foreign currency and aid technology transfer to Tanzania. According to statistics given by the Minister for Health, Community Development, Gender, the Elderly and Children, Ms Ummy Mwalimu, Tanzania imports about 94 per cent of its needs in medicines from Kenya, Uganda, India and other countries - with only six per cent being sourced locally. "So, the meeting was meant to encourage more investors to put their money into this most promising sector, where they're assured of a reliable market as the government has the ability to procure drugs worth up to Sh500 billion from locals if they will be able to meet the set standards," Ms Mwalimu said. She explained that over Sh1 trillion is spent annually on procuring medicines. Speaking at the event, MSD director general Laurean Bwanakunu said the new move would be a relief for the country, which sorely needs more pharmaceutical facilities, as this would, among other things, shorten the time for delivery of drugs as they are ordered. Other new investors in the pharmaceutical sector are Alfa Industries Tanzania Limited, Mwafrica Pharmaceuticals, Prince Construction Dypercor Holding Company Limited and MIG investment limited. Yet others who have also shown interest in the venture are Tanzania Private Sector Foundation chairman Reginald Mengi, Mr Mohamed Dewj, Mr Aziz Gulam, Kairuki Pharmaceuticals, Suma JKT, Zinga Pharmaceuticals and Biotech Limited. Patients suffering from severe cardiac conditions that require electrophysiology treatment will have it easier, after Agha Khan hospital, Mombasa launched a cardiac electrophysiology program to take care of such conditions affordably. Agha Khan hospital, Mombasa is now the only hospital with an electrophysiology program in East and Central Africa. The program headed by an internationally certified EP cardiologist will be a regional referral centre. The Aga Khan University Hospital in Nairobi has introduced a new service to help prevent prolonged brain damage for patients who suffer sudden stroke. Cases of ischemic stroke due to diabetes and high blood pressure have become common with medics recommending that such patients get medical attention within an hour or two of occurrences. A stroke occurs when the blood supply to part of your brain is interrupted or reduced, depriving the brain tissue of oxygen and nutrients. Within minutes, brain cells begin to die. The standard treatments to reduce brain damage are thrombolytic medications which thin the blood to break down the blockage and mechanical removal of the clot using a catheter. Thrombolytic medications need to be administered within few hours of the onset of the stroke. Alternately, removal by catheter also known as mechanical thrombectomy is most effective during the first eight hours of a stroke attack, but may still have good results in select patients up to 24 hours after a stroke. This recently introduced treatment expertise, mechanical thrombectomy, makes use of a state-of-the-art catheter and stent to enter the blocked artery and remove the clot and produces much improved results than thrombolytic medications if carried out within 24 hours of the start of a stroke. A catheter and stent can be inserted into the brain to remove the clot and allow return of blood flow, preventing any further brain damage. Currently, Aga Khan University Hospital is the only facility offering this procedure in East and Central Africa. “It is apparent that stroke attacks are becoming more frequent in Kenya and there’s need to have a fast-response unit to manage its conditions hence the establishment of the service. This increase is attributed to the growing numbers of people leading a sedentary lifestyle, including unhealthy diet of fast foods. Coupled with lack of exercise, this results in obesity which tends to cause strokes and heart attacks,” Dr Edwin Mogere, a Consultant Neurosurgeon at Aga Khan University Hospital says. To save the patient’s life and minimise disability, recognising symptoms and seeking medical attention in the shortest possible time is a matter of top priority. The most obvious indicator is numbness or weakness of the face, arm, or leg especially on one side of the body. The two towers in Mazgaon will be used for free-sale and to rehouse existing tenants; a new hospital will come up on a nearby plot. The 200-bed Prince Aly Khan Hospital, one of the city’s largest charitable hospitals, will be razed to make way for two high-rises on the Aga Hall Estate property in the heart of the city at Mazgaon. While one of the high-rises, 48 storeys tall, will be used to re-house the existing tenants, about 200 of them, the other tower, a 57-storey building, roughly 233 metres tall, will be used for free-sale. The hospital will be rebuilt on another plot of land across the road from its current location. THE Aga Khan Hospital has launched a new technology that will significantly secure the effectiveness and efficiency in the delivery of quality health services to Tanzanians while reducing waiting time for patients’ diagnosis. The American College of Cardiology has partnered with Aga Khan Health Services to implement the CathPCI Registry in two hospitals in East Africa. These hospitals are the first in the region to participate in ACC's NCDR registry program. Clinical data registries, like those that make up ACC's NCDR, are an increasingly important means of tracking and assessing quality of care and outcomes associated with certain populations of patients with heart disease around the world. Registry data can also be used to perform cutting-edge health outcomes research and identify gaps in cardiovascular care. The CathPCI Registry assesses the characteristics, treatments and outcome of heart disease patients who receive diagnostic catheterization as well as percutaneous coronary intervention procedures. In the initial phase of this five-year collaboration, two Aga Khan hospitals in Tanzania and Kenya have been selected to participate in the CathPCI Registry. A groundbreaking ceremony for construction of the Aga Khan Medical Center has been held in Khorog, the capital of the Gorno Badakhshan Autonomous Province (GBAO). The ceremony was attended by Mr. Shodikhon Jamshed, Governor of GBAO, and Mr. Akbar Ali Pesnani, Resident Representative of the Aga Khan Development Network (AKDN) in Tajikistan. They laid the time capsule with a message to future generations in the foundation of the medical facility building. At first, the medical institution is expected to serve 48 patients, then this figure will increase to 254 during three years. The center will also cater for the border regions of Afghanistan’s Badakhshan Province. GBAO Governor Shodikhon Jamshed appreciated AKDN’s support for improvement of socioeconomic situation in Tajikistan, particularly in Gorno Badakhshan. For his part, Mr. Akbar Ali Pesnani expressed gratitude to the Government of Tajikistan for support for the implementation of various social programs in the regions of the country. He expressed confidence that cooperation would be continued. According to him, the new medical center will not only improve the quality of medical service in the region but will also assist with training of skilled medical specialists. Turas Company is building the new medical center in Khorog. Most builders are reportedly local residents. Although the center is a private organization, financial difficulties reportedly do not create obstacles to the provision of medical services to the needy. "NCDR provides important resources to hospitals and practices around the world as we all strive to improve the quality of the care we provide to our patients. The ACC's efforts to expand NCDR globally is vital to our mission of transforming cardiovascular care and improving heart health," said ACC President C. Michael Valentine, MD, FACC. "In addition, the challenges of health care in this region are well-known--from low access to insufficient research. This partnership with Aga Khan Health Services will provide these first NCDR registry sites quality metrics to improve heart health in their communities." With the debut of NCDR in East Africa, the total number of countries participating in one or more of the ACC's clinical registries is 10. Through these partnerships, the ACC hopes to leverage NCDR data to create a collaborative global network to inform quality of care measurement and feedback, device surveillance, assessment of patient-centered outcomes and more. Sulaiman Shahabuddin, Regional CEO for Aga Khan Health Services in East Africa, said, "We are grateful to the American College of Cardiology and the Aga Khan Health Board, USA, for enabling the Aga Khan Hospitals in Mombasa and Dar es Salaam to participate in the registry which will allow these hospitals to improve the quality of their recently established cardiovascular programs by tracking and benchmarking outcomes of cardiovascular procedures. The Aga Khan Hospitals in Mombasa and Dar es Salaam are proud to be the first hospitals in East Africa to be members of the CathPCI Registry." Aga Khan Health Services, an agency of the Aga Khan Development Network (AKDN), works to create efficient and appropriate health systems for improving the health of individuals and populations in low- and middle-income countries. The AKDN operates one of the largest non-profit, private healthcare systems in the developing world, with 17 hospitals and 450 other health facilities providing quality health care to over 5 million people. These include 14 ISO-certified and 3 JCI-accredited hospitals in recognition of meeting international quality standards in health delivery and hospital care. The AKDN health agencies work closely together on planning, training and resource development in health care, and support government health services and other providers in building effective national health systems. Dar es Salaam. The French International Development Agency (AFD) has spoken highly about efforts of implementing health projects. It said millions of people had benefited from the projects. 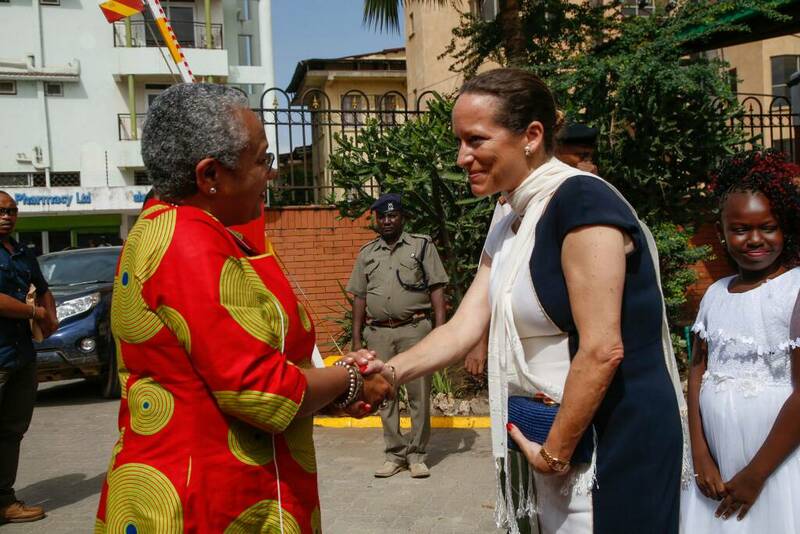 That was said by AFD chief executive officer Rémy Rioux on Monday, June 18, during his tour of the Aga Khan Hospital here to see the progress of a Sh192 billion project for the expanding the hospital and establishing 27 outreach health centres. The project is funded through a concessional loan of Sh123 billion issued by AFD and a grant of Sh69 billion from The Aga Khan Development Network (AKDN). My brother Huw Thomas, who has died aged 79, lived in Bangor, north Wales, where he was chief executive of the Gwynedd health authority from 1983 to 1996. In a distinguished career in NHS management, he also worked in Kenya, running the hospitals in Kisumu on Lake Victoria, and in Zambia. For four years from 1999 he worked with the Aga Khan Foundation in Tajikistan, helping to sort out a huge Soviet-era hospital in Khorog, on the Afghan border. While there he became aware that many baby girls in the region suffered from a congenital hip problem that could be easily rectified if treated correctly. He personally set up and financed a health initiative to provide treatment. When his time in Khorog came to an end, he was presented at a ceremony with full traditional Tajik costume and a carpet with his face woven into it. The local headman said that he “would be remembered for a hundred years”. The project will cover district councils of Kwimba, Magu, Misungwi, Nyamagana, Ukerewe, Sengerema, Ilemela and Buchosa and is jointly being financed by Agha Khan Foundation Canada and the government. The two organisations are keen to influence health policies in the East Africa region, closely working with the region’s governments to facilitate key changes in health planning and financing. NAIROBI, KENYA, SEPTEMBER 20 &#8213;The Aga Khan Foundation (East Africa) has entered into a partnership with Amref Health Africa, aimed at elevating health standards in East Africa. The two key institutions have signed a Memorandum of Understanding (MoU) to undertake joint health programmes in the region. The Aga Khan Hospital Mombasa has opened a clinic in Voi town, Taita Taveta County to take services closer to clients who travel all the way to Mombasa for treatment. The Voi centre will work closely with Mombasa branch hospital to ensure smooth patient referrals and admissions when necessary. The centre is complete with a radiology, ultra sound, laboratory, a well stocked pharmacy with cost effective drugs, a nurse and a doctor to offer outpatient services. The centre which opened its doors to patients Wednesday is expected to be officially launched soon. Speaking on phone, the hospital’s outreach manager at the Coast, Janet Mzigo said the clinic will provide quality healthcare services to patients. “The opening of the new clinic is a boost to provision of quality healthcare services in the region,” she said. She said speciality services such as maternal care, cardiology, nephrology, paediatrics and genecology, which are much needed in the area, will be launched later. Speciality services will be offered once a week, she said. KARACHI - Population Welfare Department and Aga Khan Health Service Pakistan signed an MoU for the supply of contraceptives by the Population Welfare Department to working in the area of reproductive health and planning.